Encouraging those itty-bitty clippings to get growing can be tough since nascent roots need to be submerged in water and shielded from the sun while leaves need to stay dry yet sundrenched. The Rootcup resolves these horticultural hang-ups in a petite, high-design package. To use it, simply place your plant cutting in the rootcup, add water, put your plant in a comfortable and well-lit place, and wait for little roots to propagate! When your seedling has enough roots, it's ready to be moved into dirt to grow on its own in your indoor or outdoor garden. This innovative cup is made out of a squishy, non-toxic proprietary elastomer made from common beach sand. Designed by good3studio in San Francisco. Assembly and packing is done at a San Francisco non-profit workshop that provides employment to persons with disabilities. Root Cup is dishwasher safe. 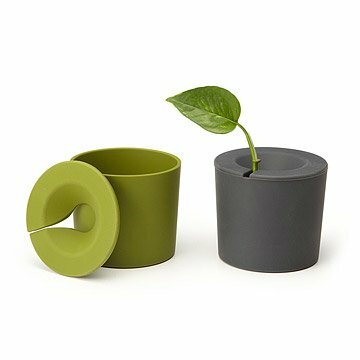 Root Cup - Gray and Green have been discontinued. When they sell out, they will no longer be available. Product is easy to use and provides great results. I'd recommend this to others, especially for novice gardeners. My avocado pit is thriving thanks to this product. Love it! The Rootcup encourages clippings to take root through high-design.